Way back in 2014, director Dean DeBlois spoke about how he "talked Jeffrey Katzenberg (then Chairman of DreamWorks) down" from making a fourth part to the franchise, stating that he was committed to making a story that had a strong sense of integrity and just three chapters. It has been five years, and DreamWorks has since gone through management changes, but DeBlois to his credit stayed dedicated to his vision - and has served us a fitting finale. Hiccup (Jay Baruchel) and Toothless are back at it again, about a year after How To Train Your Dragon 2, this time being chased by Grimmel the Grisly (F Murray Abraham) - who happens to be the man responsible for the near extinction of the Night Fury species of dragons that Toothless is apparently the lone survivor of. 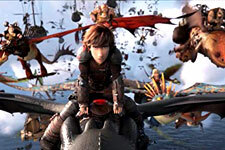 Hiccup is now the chieftain of Berk, and wants to take his entire tribe (dragons and all) across to the end of the world because their dragon-loving ways are attracting a lot of nefarious eyes. The wonderfully bellicose Vikings of the previous movies have since banded together closer, and agree to follow Hiccup to the unknown. On the way, Toothless gets a girlfriend, a Light Fury or Bright Fury (which is easily the most memorable arc of the entire movie), and Hiccup finds out what it means to be a leader. With his hilarious bunch of friends Snoutlout (Jonah Hill), Fishlegs (Christopher Mintz-Plasse), and the twins Ruffnut (Kristen Wiig) and Tuffnut (Justin Rupple); and his long-time love interest Astrid (America Ferrera), Hiccup Horrendous Haddock III finally comes to terms with the fact that he can be someone of consequence without depending upon his dragon. The How To Train Your Dragon movies have been focussed heavily on visual storytelling, and the third part is not very different. Wide shots of mesmerising flight sequences, colourful dragon and human symbioses, and some slightly darker, grittier fight scenes are without question the most compelling narrative decisions DeBlois has taken. On the flip side, the story takes somewhat of a back seat as the script finds it hard to bridge the gaps between the swashbuckling action and the more reflective, personal scenes. How to Train Your Dragon: The Hidden World also satisfactorily addresses a question that has interested many from the time the trailer was released - whether the bond between human and beast will be tested by the introduction of a potential partner for the dragon. The script in the trilogy has always been a bit sombre for a children's movie - Hiccup losing his leg, Stoick the Vast dying, and underlying themes of grey in the quieter moments of a colourful and magical ride. In this movie, the major theme is growing up, and letting go (we're not going to lie - it evokes a sense of nostalgia in the adult audiences, especially those who grew up with the series). Jay Baruchel is fantastic as always, managing to convey the awkwardness and self-doubt Hiccup faces while never faltering at the heroic bits. America Ferrara is burdened (but never underperforms) with an Astrid that seems to never get support, despite extending plenty of it while being a badass in her own right. Craig Ferguson is a delight as the podgy old Gobber, and Kit Harrington's Eret is surprisingly memorable despite his few lines. The comic timing of all the side characters (Jonah Hill, Christopher Mintz-Plasse, Kristen Wiig and Justin Rupple) is great. Justin Rupple, especially, does a great job making sure T J Miller isn't missed much. John Powell's score is another feather in the movie's cap, especially with wonderful Gaelic-inspired pieces which round out long sequences featuring Toothless that have little (or no) dialogue. The silly courtship dances by Toothless to impress the Light Fury are especially brought to life by the accompanying soundtrack. How to Train Your Dragon 3 manages to convey a lot of emotion through pure imagery that is bound to mesmerise most of the younger members of the audience. What you won't expect is how much it manages to captivate the adults as well, especially those young adults invested in the series since its inception. Definitely worth a watch. 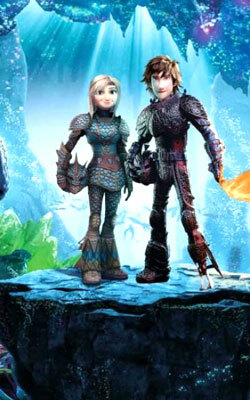 Be the first to comment on How to Train Your Dragon The Hidden World (Telugu)! Just use the simple form below. fullhyd.com has 700,000+ monthly visits. Tell Hyderabad what you feel about How to Train Your Dragon The Hidden World (Telugu)!